A 1,000 meter-wide asteroid is heading towards Earth this week – and its course will reach its closest point to our planet on Friday, according to NASA. Traveling at a speed exceeding 37,000 kph, the 2014-YB35 asteroidis set toapproach Earth from a distance of 4,473,807 km – some 11.7 times further away than the moon – according to NASA's Jet Propulsion Laboratory. But should the asteroid's orbit be closer, the impact of collision could be devastating – and trigger earthquakes and tsunamis, as well as climate changes. For an asteroid of its size, it would not be difficult to beat the Tunguska Event of 1908, which left some 80 million trees knocked down in Siberia and sent a shock wave measuring 5.0 on the Richter scale. The asteroid was discovered by the Catalina Sky Survey in December last year, and is expected to “return” back to Earth in 2033, this time at a distance of about 3,330,000 km. 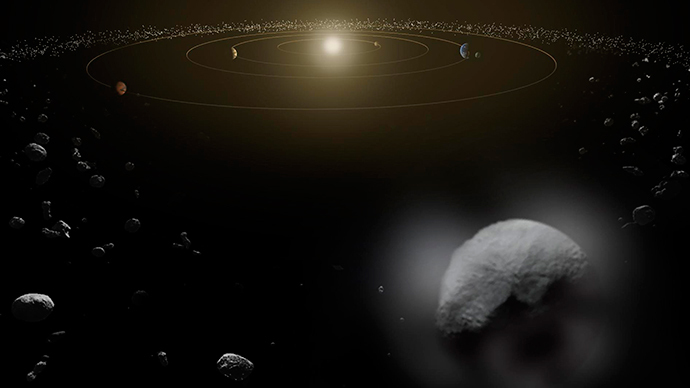 The Minor Planet Center has classified it as a potentially hazardous asteroid (PHA). According to NASA, outer space is home to over 1,500 PHAs. “Potentially Hazardous Asteroids (PHAs) are currently defined based on parameters that measure the asteroid's potential to make threatening close approaches to the Earth. This ‘potential’ to make close Earth approaches does not mean a PHA will impact the Earth. It only means there is a possibility for such a threat,” a NASA spokesperson said. This January, a massive asteroid the size of a mountain traveled past Earth at a much closer distance of 1,199,600 km, or 3.1 lunar distances. 2004-BL86 gave scientists a chance to learn more about the nature of asteroids – and, to their surprise, they found out that the space rock has its own moon.